I've long thought that Time was really ahead of its time with all of the switching options available on many of their guitars. If I count 'em up, I come up with 20 "sound options" on my GS (with series and parallel off, I have the three way plus the two taps for 8 options, with series and/or parallel on there are 12 more and the three-way is dead as I recall). Anyway- I realized that they weren't so much ahead of their time as standing alone, since controls on guitars these days are so limited. ...that's not to say I don't love my Tele, but it sounds like a Tele (and through the Zeeta it's magical). The GS will never sound like a Tele, no matter how I flip the switches, but that's ok 'cause it's not a Tele. Anyway- my wife heard on NPR yesterday about this new company in Maryland that's been started up by an engineering professor at UM, where they basically do the whole "megaswitching" thing. His story is somewhat interesting, and I haven't listened to the sound clips yet but my wife says what they played on the radio sounded really good. The big difference between their approach and the Time approach is that a substantial part of the setup is a "circuit board" on the "back", although I'm not really sure what that means outside of the fact that you can configure the guitar with jumpers, which sounds tedious and irritating especially if you're playing live. Anyway, they talk a little about their switching on their site, and I thought the Time crew would dig it, so I present to you all http://www.coil-guitars.com/. Frankly I don't particularly like their body design. I'm also not struck with confidence that they've outsourced the manufacture of their instruments since quality control then leaves a lot to be desired. However, the price seems right for what they're offering, assuming the instruments themselves are any good. Prices range from $1000 to about $1700, depending on choice of pickups and breadth of switching options. ...I started thinking about that orange explorer though that that guy in NC is selling. Wondering if I could part with $1600 without wanting to shoot myself. My V would love a partner. The web site and flash app is cooler than the guitar. I read with amusement about how the 1st thing everyone does with their new guitar is, rewire it!' LOL. I would like to think the 1st thing is to make music! I recognize all the sound permutations. The Times really were pared down to the best & most useful options. 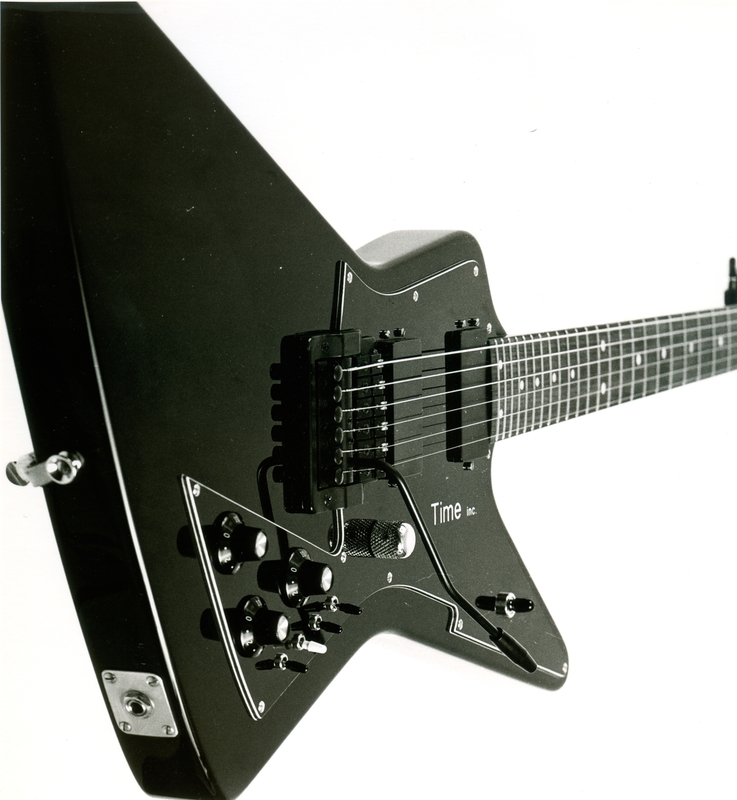 Early Times from Waltham had a coil drop and pickup phase switches for each pickup. The mini switches were located 2 over 2. They didn't combine the pickup in any way. The pickup phase switches really cut the volume. After some sort of epiphany, Alan boiled the switching down to coil drop, Master phase, Master series/parallel. I think that is the most useful, bang for buck switching. The Vee's & Prime Time's had just the two master switches and no coil drops. The Time caster added the center pickup into the mix. From what I've seen, no one has ever done any switching like the Master phase and series combos. Still ahead of it's time and no 9v battery needed! When we sold guitars directly , we met with the players and could explain and sell the switching. As we grew and pushed into dealers, it was harder to convince a 3rd party about how to use and sell the switching. The Advance Times were a reflection of this. The AT3 had three on-off switches. I don't know if that was right or wrong, but that was long ago. I think the players that really wanted and understood how to use the switching were a minority. I think the majority just wanted open the case and go. Of course, The other huge factor was the rise of Eddie VanHalen. EVH really changed the buyer's preferences in the 80's. And don't worry, there's more Explorers in the Sea!